I admit it: I am a tech geek. I love watching TV shows at the same time that I’m on Social Media. Most who know me know I’ve worked on many live TV events, including award shows. So, it’s probably not that big of a surprise that I am into #SocialTV. Last nights #Oscars event was as comical on Twitter as it was on camera. As all of the “industry” talks about the awards, the social tech industry talks about the winning Tweets. The conversation surrounding Kevin Spacey (as the character Francis Underwood) in the highly binge-able Netflix show, House of Cards. 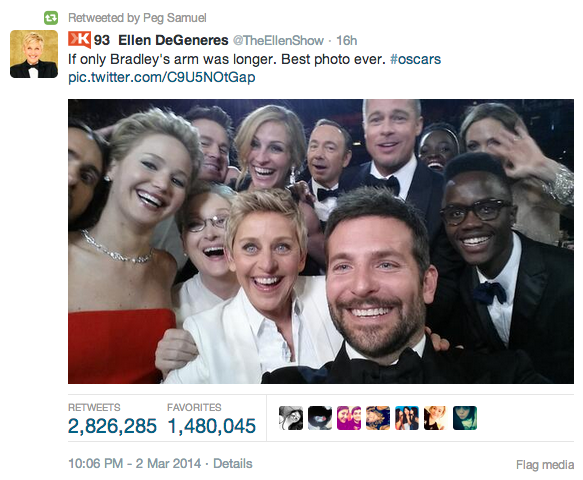 This selfie broke the world record for ReTweets (RT) within 45 min, garnering over 1.6 million RT. Right now, it has 2.7 million RT and 1.4 million favorites. This tweet even made hiccups in Twitter’s service, which is incredible. In other words, this was a home run for Samsung, the #Oscars, and the @TheEllenShow. Although, definitely staged, I enjoyed the pure authenticity feeling of the entire conversation and the star power. It was a simple tweet that was not overly branded.